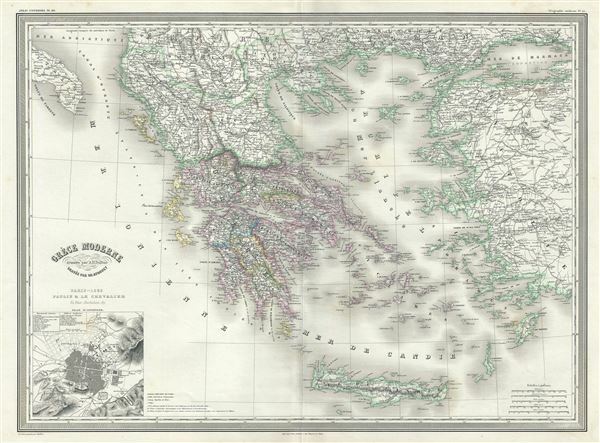 This is an attractive large format 1860 elephant folio map of Greece and its colonies by A. H. Dufour. It extends from the Gulf of Taranto to the Sea of Marmara and south as far as Crete or Candia. Throughout, the map identifies various cities, towns, rivers and assortment of additional topographical details. An inset in the lower left quadrant features a plan of Athens with ancient and modern monuments noted. This map depicts the waning years of Ottoman hegemony in the region, with the Greek nationalist movement attaining independence for the Peloponnese in 1821. The Ionian Republic, under the protection of Great Britain, was also free of Ottoman control. The other Grecian and Balkan states, including Serbia, Croatia, Moldavia, Wallachia, Albania, and Macedonia, remained at least nominally under Ottoman control until 1878. This map was prepared by Auguste-Henri Dufour and engraved by Charles Dyonette for publication plate no. 29 in Armand Le Chevalier's 1860 edition of Atlas Universel, Physique, Historique et Politique de Geographie Ancienne et Moderne. Chevalier, A., Atlas Universel, Physique, Historique et Politique de Geographie Ancienne et Moderne, Paris 1860. The 19th century French cartographer Auguste-Henri Dufour began publishing the dramatic elephant folio Atlas Universel, also occasionally titled Grand Atlas Universal, around 1855. Several editions appeared between its initial publication in the 1850s and a final run c. 1870. The 1863 and 1864 editions in particular are highly desirable among collectors because the United States and North America maps illustrate the proposed, but unrealized, state of Corona (roughly modern day Utah). The atlas contained roughly 40 maps, most of which were engraved by Louis Antoine (the maps) and Deletre (typography) under the supervision of Charles Dyonnet, official engraver of the Depot de la Marine. The Atlas Universal was published in Paris and edited by the firm of 'Paulin et le Chevalier,' 60 Rue Richelieu. Very good. Minor wear along original fold lines. Minor spotting at places.